356 pages | 15 B/W Illus. Part I: Concepts 1. How Knowledge and the City Met 2. Bringing Up the City: Essentials 3. Knowledge, Urban Planning and Development 4. Managerial Toolbox for Knowledge-Based Challenges Part II: Applications 5. Pursuing Knowledge as a Means for Development 6. 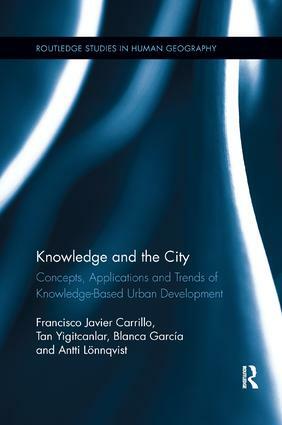 Global Knowledge-Based Urban Development Perspectives and Practices. 7. Practices of Knowledge-Based Performance Management. Part III: Trends 8. Knowledge Markets and Urban Transformation. Afterword. Francisco Javier Carrillo is Professor of Knowledge Management at Tecnológico de Monterrey, México. Tan Yigitcanlar is Associate Professor of Urban Planning and Development at Queensland University of Technology, Australia. Blanca García is Senior Lecturer of Development Policy Administration at El Colegio de la Frontera Norte, México. Antti Lönnqvist is the Dean of School of Management at University of Tampere, Tampere, Finland.